Food delivery software enables restaurants to dispatch orders to drivers and provide on-demand delivery to customers. The best restaurant delivery software integrates directly with point-of-sale (POS) software, so you can manage everything from one screen. Pricing varies for the cloud-based software, but averages less than $100 per month, depending on your business size and needs. Unlike a third-party delivery service, like Uber Eats, restaurant delivery software lets restaurants take control over accepting orders, assigning deliveries to drivers, and avoid costly markups. We looked for food delivery software that includes GPS tracking, apps to communicate with drivers, SMS alerts for customers, and API integration, all of which help track deliveries, drivers, communicate with customers about orders, and provide better overall restaurant management. More advanced features might include a landing page for online ordering, messaging within the app, and employee management, such as scheduling and reporting to help you analyze driver data. Pricing: There are free options and $2,000-per-month options, but we found plans to suit every level of restaurant, from small cafes to chain restaurants. Ease of use: Restaurant delivery software should be relatively easy to use, though some more advanced software will require more know-how. Dispatching: You should be able to assign an order to an available driver in the area. GPS tracking: Dispatchers, drivers, and customers should all be able to follow a driver’s route from pickup to delivery. Integration: We considered food delivery software that integrates with POS systems to reduce the number of apps you have to manage. Reporting: We looked at how restaurant delivery software lets you analyze data, such as average deliveries per day, week, and so on, average delivery times, distance traveled, and more. Zippykind can be integrated with some of the most popular POS software used by restaurants, and restaurants won’t have to sign any long-term contracts. 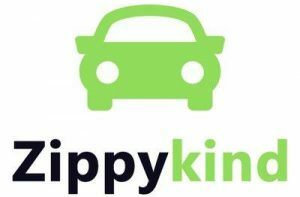 We recommend Zippykind as the best overall food delivery software for any small business that wants to dispatch drivers themselves, rather than rely on a third-party company. It’s affordable cloud-based software that restaurants use on a browser and drivers use via an app to receive delivery instructions. Zippykind is restaurant delivery software that makes it easy for independently-operated eateries to meet the on-demand delivery expectations of customers. Online and phone orders become quick deliveries with the web-based app; drivers receive jobs through an iOS or Android app. It’s free for up to 50 deliveries, then $87 to $570 monthly with other plans. Zippykind offers a free plan, so you can try out the food delivery software. What’s missing from the free plan, though, is SMS messaging and voice, plus there’s no route optimization or planning. The cost range for the other plans is $87 to $570 per month, but it works with credits. The higher tiers get you lower costs per delivery. You’ll pay 29 cents per delivery on the Meadow plan, and 19 cents per delivery on the Orchard plan. It’s a more affordable option for a small restaurant doing occasional deliveries, especially compared to Mobi2Go or Onfleet. Zippykind covers all the basics of food delivery software, from dispatching and delivery to route optimization and customer notification. There’s even a rewards program, driver track log, and analytics, so you can predict busy delivery times, analyze driver routes, and see which drivers are your high performers. 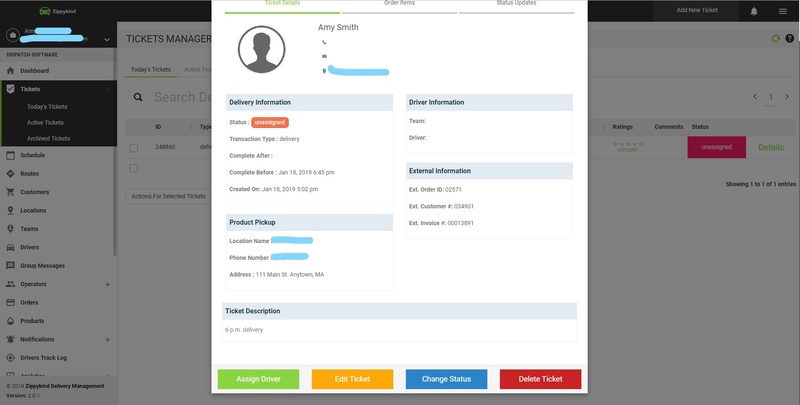 In the back-end, Zippykind lets store managers handle the dispatching of new orders to drivers. You set the delivery fee, zones, and more. Brand your notification templates with your logo and business name, and then notify customers by email or text that delivery is on the way. A link is included for them to follow the driver’s route. There’s a built-in rewards program that tracks how much customers spend with you, so you can offer discounts to your most loyal customers. In Zippykind, you can easily create a new delivery ticket from any browser, and then assign a driver to pickup and deliver. The front-end mobile app is for the drivers to accept deliveries, along with pickup and drop-off addresses, and route optimization, if you pay for that add-on feature. Drivers can upload photos for proof of delivery and collect signatures, if needed. You create driver profiles so that customers know what type of car to look out for and the name of the driver they should greet. When a customer places an order for delivery through your restaurant, Zippykind searches the internet for a photo that corresponds with the email address used, so your driver knows who to look for when making a delivery. If you want drivers and customers to communicate, you can add on a local phone number through Zippykind that routes calls between the two, without revealing your driver’s personal phone number. Zippykind includes drivers’ logs, so you can see routes taken and ensure you’re paying drivers for accurate mileage. Also, you can analyze data to figure out delivery trends, whether by time, day, or season. Customers can rate drivers and offer feedback, too, so you can see which drivers are performing the best, whether by rating or speed of delivery. Also, you can integrate Zippykind with almost any other app, including Shopify POS, QuickBooks Online, and more. Zippykind includes most features you could need in food delivery software. If it’s missing anything, it would be customization of delivery tickets and delivery times. It’s all updated in real-time, so you can’t offer delivery time windows. Overall, Zippykind reviews online are positive. Users have noted how easy it is to use the software and manage deliveries for their own restaurants or other small business without having to partner with a third-party option. It’s still relatively new, so there aren’t many reviews available. Zippykind combines dispatching, a delivery app, reporting, customer profiles, a reward program, and easy integration with business management apps you’re likely already using. If you own a restaurant and want to manage delivery with your own drivers, Zippykind could be the food delivery software you need. Sign up for Zippykind today. Initially, Mobi2Go was an online ordering system, but it’s morphed into food delivery software, as well. You’ll be able to customize your website for online orders from the Mobi2Go web app, set up delivery zones, and seamlessly integrate any POS system, from which you can import your menus. You can even get a branded app. The standard Mobi2Go plan starts at $59 per month, which doesn’t limit your orders or delivery, like Zippykind, which makes it far more affordable on an ongoing basis. However, there’s a $999 onboarding fee. Plus, there’s a 3% charge on orders. Mobi2Go offers its own payment gateway, where the rates are 2.9% plus 30 cents per transaction for Visa and Mastercard charges, and 3.4% plus 30 cents per American Express transaction. 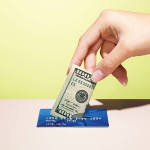 Or, you can use your own payments processor. In a way, Mobi2Go is a bridge for other restaurant management tools you already use, so you can offer online ordering, delivery, and a branded app, and handle it all on your own. If you don’t have drivers of your own, Mobi2Go has partners you can use. And when it comes to integrations, Mobi2Go works with almost anyone. Scroll through the integrations available for Mobi2Go and you’re likely to find apps you already use. 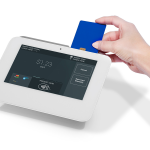 Square and Lightspeed Restaurant make the list, as do popular payment gateways. With Mobi2Go’s onboarding option, you’ll be ready to accept orders on your website and see the orders come in on your POS system. As orders come in through your POS system or email, you can assign a driver, send the order to the kitchen, and customers will know when to expect their food to be delivered. If you don’t hire drivers personally, you can use one of Mobi2Go’s partners, such as Postmates. 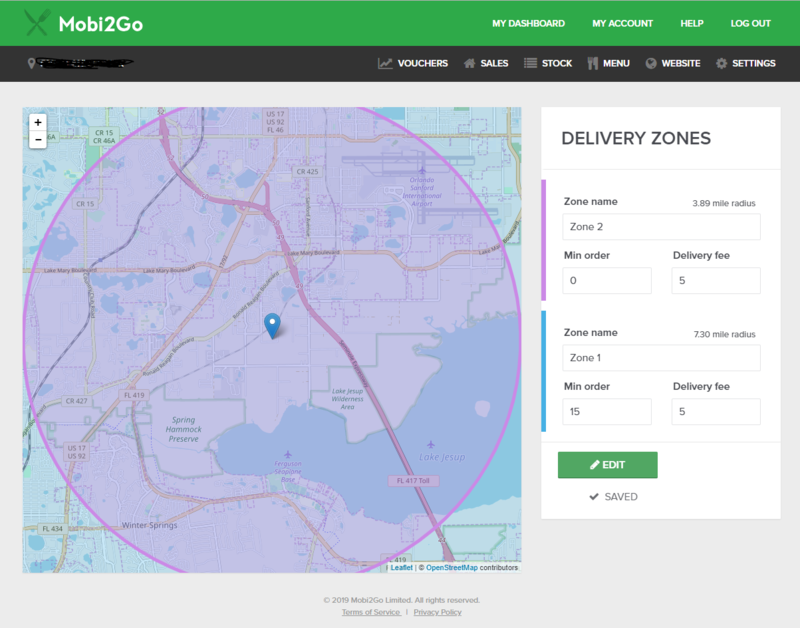 You can draw delivery zones in the Mobi2Go web app and create separate zones with different delivery fees, as needed. If you already have a website, you can add the Mobi2Go ordering system to it. Otherwise, Mobi2Go offers a landing page for online ordering. Start by importing your menu from your POS system, or add items one by one to the Mobi2Go web app. If you want a mobile app for ordering, you’ll have to pay an additional fee, starting at $1,999. While Mobi2Go fills in the blanks as an online ordering solution and food delivery software, it’s a bit expensive. The onboarding cost is steep, and if you want a personalized app, you’ll pay thousands of dollars. For API access to connect Mobi2Go to other apps that don’t already support the system, you’ll have to opt for the Enterprise plan, which doesn’t have pricing online. Also, customer support is only available by email, and you have to pay for premium support. It seems as though this food delivery software has laid low, as there aren’t many Mobi2Go reviews out there. Still, those who have reviewed it online said it’s just what they needed to be able to offer online ordering and delivery from their restaurants. It’s easy to get started, especially with onboarding help from an account manager. Mobi2Go set out to be an online ordering solution for restaurants around the world, and then expanded their services to become premium food delivery software. It connects to some of the most popular POS systems, and after all the startup costs, it becomes affordable software. You can try Mobi2Go for 30 days for free. Sign up for a trial. OnTime 360 is one of the first to offer cloud-based food delivery software that makes it easy for restaurants to offer their own delivery services, and it works especially well for restaurants with multiple locations. The software is robust in its features, including reports, dispatching, routing, and communication between dispatcher, driver, and customer. Regardless of the size of your restaurant, OnTime 360 likely has a plan that’s affordable and makes sense for your food delivery needs. The cost ranges from $39 to $349 per month, and the $99 setup fee can be waived if you opt for annual payments. To connect payment gateways and POS systems with OnTime 360, you’ll need to choose the Enterprise plan, at a minimum. OnTime 360 is about average in terms of cost compared to Zippykind, unless you opt for a higher tier plan, which makes this one of the most expensive options. Technically, OnTime 360 wasn’t built as restaurant delivery software, but many of its clients operate pizzerias on the East Coast and have had great success with order entry, dispatching, real-time communication, and the customer portal. The API access lets you connect OnTime 360 with other software you use to manage your restaurant, but you’ll likely need to hire a professional to help connect the apps. Adding a new order entry in OnTime 360’s food delivery software is straightforward, and you have several fields in which to enter a variety of information. Include the customer name, pickup location, delivery location, description, and cost for delivery based on distance or zones. The option to set pickup location is what makes this easy for multiple locations to use the same system for deliveries. Before accepting orders in OnTime 360, you’ll want to populate the food delivery software with drivers and their information, so you can assign a driver per each order. Once you’re ready to submit the order, you’ll get a tracking number, which you can give to your customer so they can track it. 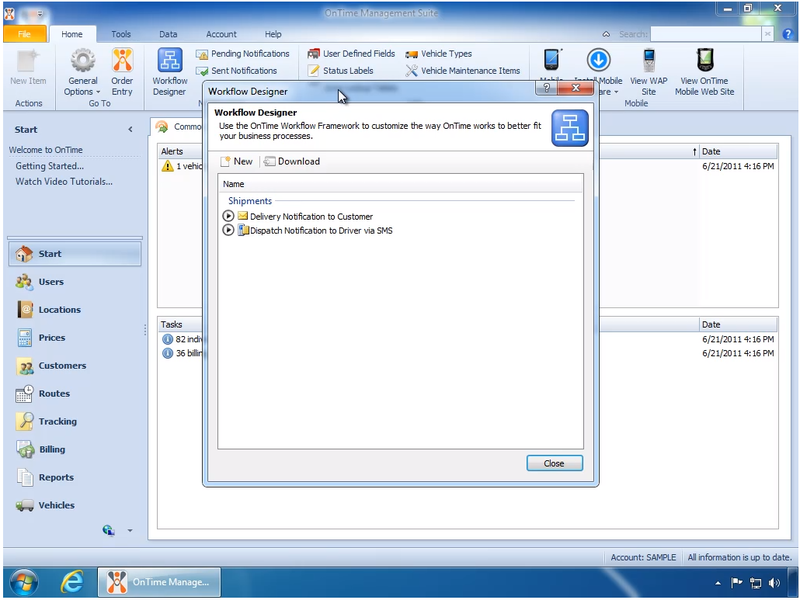 You can drag and drop drivers to each order, and the drivers can accept orders and start the delivery process. Color coding and pending notes make it clear when a driver is busy and cannot accept orders at the time. You can send a notification by email or SMS message to customers and drivers from OnTime 360. The OnTime 360 mobile app is free to download, which is typically the case for most restaurant delivery software. Restaurants and drivers can communicate within the app, and GPS tracking is included, so you know where orders and drivers are. Plus, there’s barcode scanning and options for collecting signatures, so restaurant managers know a delivery was successful. Customers do not count as users in OnTime 360, so you can offer logins to an unlimited number of customers. From the customer portal, customers can create orders themselves and they can get a quote for the delivery. Once they submit the order, they can get a tracking number and follow the delivery themselves. Although OnTime 360 is robust in its features and it’s easy to use, it’s still a complex system with more features than you may need from restaurant delivery software. The interface is simple and resembles older standard Windows-style programs, so it’s lacking a clean and updated user experience (UX). Also, if you want to connect OnTime 360 with any other program you use, you’ll have to commit to the $199 per month plan, at the very least. In OnTime 360 reviews, it’s clear that customers are mostly satisfied with what they can do with this food delivery software. Users have noted that it’s easy to use, and customer support is helpful. However, the software’s appearance leaves something to be desired, and the mobile functionality is behind the times, especially compared to Zippykind. OnTime 360 is a powerful restaurant delivery software option that would work well for multiple locations providing delivery service. It’s easy to use and affordable if you’re using it across multiple restaurants. You can get a $75 credit and a 14-day trial with OnTime 360. Sign up today. Tookan is food delivery software with multiple plans to fit several business sizes, but it’s best suited in the lower tiers for smaller restaurants with few deliveries per week. It offers three views, one each for a dispatcher, driver, and customer. It’s an affordable choice if you opt for month-to-month plans without any add-on features. Tookan offers month-to-month plans and annual plans starting at $15 per month, and reach as high as $899 per month. There are multiple add-on features that come with added costs, but they’re only available with a personalized quote. Tookan closely compares in features and cost to Zippykind, but to get full functionality, you’ll have to pay more with Tookan. Like any other food delivery software, Tookan connects a dispatcher with a driver, and then notifies a customer that their order is on the way. At its base, Tookan does only that, and includes API access, so you can connect apps like Square or online ordering apps. There’s a built-in chat feature, so a dispatcher can communicate with drivers. If you want to get a branded app and dashboard, you’ll have to choose the Enterprise plan or pay thousands for it. You’ll have to have an ordering solution in place or a connected app, as Tookan doesn’t include that feature. It handles the dispatching and delivery part only. So, you simply create a task with a pickup address, drop-off address, and a description of what’s being delivered. Once you have a task created, you can assign it to a driver in your system. The customer in the system will then be notified of the status of the delivery, and they can follow along from any web-based device. The Tookan dashboard shows you the tasks and drivers on either side of a map that’s updated in real-time. Similar to Mobi2Go, Tookan offers API access, so you can connect the apps you use for everyday restaurant management. You can hook up your online ordering software, POS system, payment processor, and more. The marketplace on Tookan’s website shows you other options you have, but many of these integrations cost an extra monthly fee. The Tookan web app stores all your task and driver data, so you can view the history of each, which can help you plan better for future delivery decisions. View a driver’s average time for delivery, or their task completion rate. You can also see which days of the week you have the most deliveries, which can help with staffing decisions. Tookan can help you manage on-demand deliveries, but to get full functionality from this food delivery software, you must choose several add-on features that come with extra monthly fees. For example, an email parsing integration will cost you an additional $49 per month, so fees can add up quickly. Also, Tookan is lacking in transparency with its fees and in its claim of clients (McDonald’s is not a client, but a franchisee owner is). You’ll find a variety of 5-star and 1-star Tookan reviews online, and little in between. While many users praise the simplicity of the web and mobile app, there are many others who complain about bugs and glitches. Route optimization isn’t always accurate, and though customer support is available and typically friendly, there are reports of miscommunication, and canceling an account can be difficult. Tookan is a basic dispatching web app and food delivery software that connects all three parties: dispatcher, driver, and customer. It’s easy to set up and use, and it has the ability to connect with other apps to help streamline your tasks. You can try it for 14 days for free with no credit card required. Get a trial today. DeliveryMark is not specifically made for delivery of food, but it works well as food delivery software for small restaurants, bakeries, and caterers on a tight budget. It’s the most affordable restaurant delivery software options, and it’s easy to use. 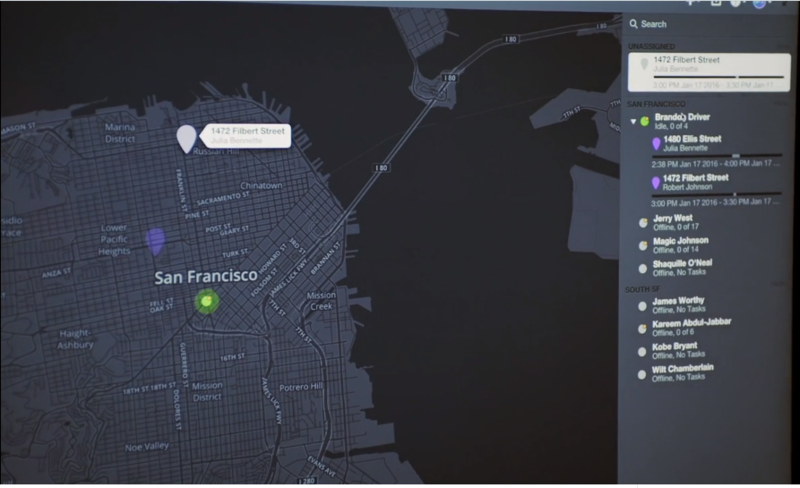 You’ll be able to give clients access to a portal where they can track deliveries. To get full functionality of DeliveryMark, you only pay $7 per driver or dispatcher. That’s it. There are no added fees. The client portal is free to use, and it gives your customers a web-based place to check in on deliveries, updates, and to communicate details of an order. This is the most affordable option on our list, but close to the functionality of Tookan. DeliveryMark keeps its food delivery software simple by offering only the basic features you would need to manage deliveries for your restaurant. You can handle all tasks, including creating orders, assigning pickups and deliveries, GPS tracking, and communicating with all parties from the dashboard. Each new order has fields for you to fill in, including customer information, pickup location, drop-off location, driver, order number, status of order, and estimated time of arrival. DeliveryMark is easy to use from the moment you download the iOS or Android app, or you can access the dashboard from a browser. If you’re a driver using DeliveryMark, you’ll receive a notification when you have a new assignment. Once you accept it, the status of the order changes. You can send messages to the dispatcher through the app, in case of late pickups or deliveries, or any other changes. Tracking is available, so a dispatcher or store manager can see where a driver is on the route. 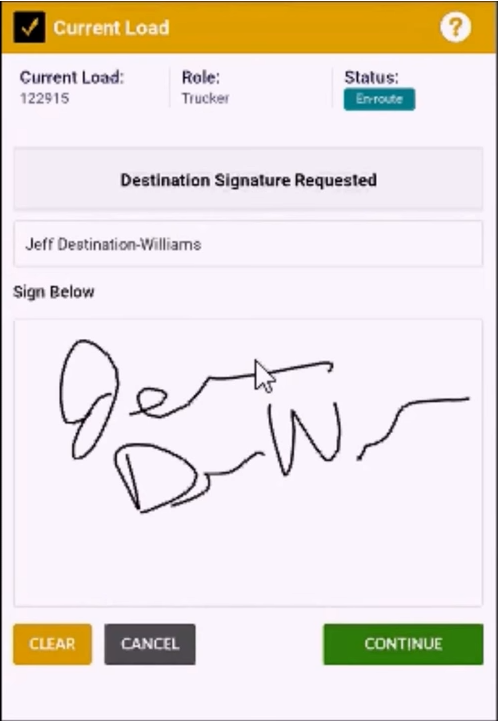 Drivers can collect signatures in the DeliveryMark app when they make a delivery. 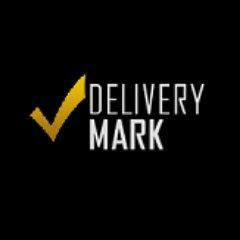 Clients who want to see when their order will arrive can use DeliveryMark at no cost. They can use the unique tracking numbers to see where their deliveries are. You’ll also be able to view documents uploaded to your order, if applicable. While DeliveryMark is easy-to-use restaurant delivery software, it’s missing a lot of features you can find with the more functional Zippykind. There’s no API access, so you won’t be able to connect your POS system, online ordering system, website, or anything else. Any orders that require delivery will have to be created in DeliveryMark. There aren’t many DeliveryMark reviews online, but of those out there, they’re positive. DeliveryMark provides everything a driver and dispatcher would need to complete a job, and it’s easy to use. It’s usable almost instantly, as there’s no real implementation, except adding drivers and clients to the database. DeliveryMark offers a bare-bones approach to food delivery software, which keeps it simple to use and more affordable than other options. It’s a good choice for a small restaurant, solo caterer, or bakery that wants to track deliveries. You can get started for free with the client view. Sign up for DeliveryMark today. Onfleet is restaurant delivery software that considers every party of the delivery, and white-labeling of the app and dashboard is available for enterprise-level restaurants. The iOS and Android apps are rated highly, and are easy to use for drivers. 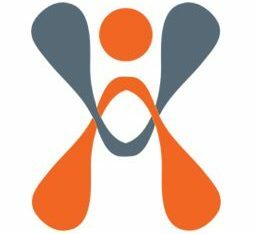 If there’s functionality missing, you can likely find it through a Zapier integration. The plans for Onfleet range from $149 to $1,999 per month, making it the most expensive option on our list. A small restaurant that wants to manage their own deliveries should look to Zippykind or Mobi2Go, but a large restaurant with multiple locations or multiple brands could benefit from Onfleet’s features. Onfleet is less about managing a fleet and more about managing tasks, which is why this could be a good solution for a large restaurant, or a collection of restaurants with a fleet of drivers. Route optimization may not be necessary for food deliveries, as drivers are likely only taking one or two orders at a time. The in-app chat function is helpful, and Onfleet offers powerful analytics. There are no user limits in Onfleet, so you can have as many dispatchers and drivers as you need. Dispatchers create orders and assign them to drivers, or you can enable auto-assign, so the system chooses the driver closest to the pickup location. Drivers use the iOS or Android app to receive delivery assignments and to track their status. You can see where your drivers are on the Onfleet web app map for dispatchers. If your Onfleet plan doesn’t include the functionality you need, you may be able to find it through Zapier, which is available for every pricing plan. The top three pricing plans allow API access, so you can connect Onfleet with whatever other program you need to streamline online as well as phone orders, menus, and other tasks. Owners of multiple restaurants or multiple brands may want to consider the enterprise level plan of Onfleet, as it includes a white-labeling solution, so you can get a custom app and dashboard. Doing so will remove all Onfleet branding, which lets you present a more professional look. Depending on the Onfleet plan you choose, customers will get an SMS message with an ETA for their delivery and a link that allows them to see the driver en route. It’s worth noting that phone calls and texts sent through the dedicated phone number you get at the higher tiers come with a price tag of 0.01275 cents per minute for a call, and 0.0065 cents per text, which is less expensive than both Tookan and Zippykind. As food delivery software, Onfleet is only missing online ordering functionality, which you can find in Mobi2Go. However, with a Zapier integration, you can add on almost any app that you need. Onfleet is also lacking an affordable option for smaller businesses. When it comes to Onfleet reviews of the mobile app, drivers are satisfied. The app is easy to use and it gets regular updates monthly. The interface of the web app for dispatchers and the mobile app for drivers get good marks for being appealing, though a bit hard to read with the dark background and light text. Onfleet offers an enterprise solution for businesses looking for restaurant delivery software. It’s especially useful if you have multiple restaurants or brands and you need to coordinate deliveries. You can try the software for free for 14 days. Sign up for a trial. Restaurants typically require a delivery solution of some kind eventually, but food delivery software is often added on later to complement established POS software. If you’re looking for a restaurant POS solution to manage your everyday needs at your eatery, plus built-in delivery or third-party delivery options, these alternatives might work for you. Food delivery software is becoming more common as on-demand delivery becomes the norm for customers. Small restaurants that want to provide deliveries on their own without the use of a third-party app would benefit from using restaurant delivery software that can help with dispatching, communication, and GPS tracking of deliveries. Zippykind is our pick as the best food delivery software because it includes all the features you need to get started with delivery, and it does so at a fair price for small businesses. If you want to connect it to software and apps you’re already using, you can likely integrate it. To get started with 50 free delivery tickets, visit Zippykind’s website today.